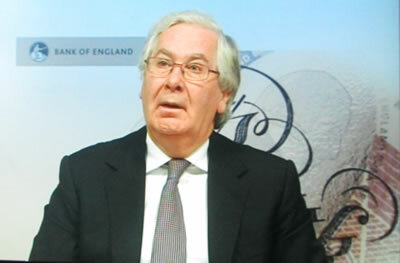 Mervyn King delivered his last Bank of England Quarterly Inflation economic propaganda report as he is due to make away for the Canadian Central Bank governor Mark Carney in June. His final message was one of economic optimism in terms of forecasting stronger economic growth going forward of 2% in 2 years time. "There is a welcome change in the econ comic outlook, today's projections are for growth to be a little strong and for inflation to be a little weaker than we expected 3 months ago, that is the first time I have been able to say that since before the financial crisis"
The problem is that the Bank of England every year says virtually the same thing!, Higher growth and lower inflation that repeatedly FAILS to materialise. For instance 2 years ago (May 2011) the Bank of England forecast that the UK economy would by now be growing by 3% (0.6%) and Inflation would be at 1.8% (2.8%). Therefore Mervyn Kings 2nd term as governor of the Bank of England given the continuing poor state of the British economy and that the Bankrupt tax payer bailed out still to too big to fail banks continue to hold the country to ransom, can only be concluded as being an unmitigated disaster, which has seen Inflation rage by more than 20% and the UK economy shrink and still remains 2% smaller than it was 5 years ago - A DISASTER for ordinary people! The Bank of England has been behind the curve in virtually every signifcant econcomic event of the past 5 years. The BoE missed the Great Recesssion of 2008-2009 and every econcomic forecast for growth has FAILED to materialise. 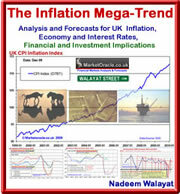 The BoE missed inflation soaring to as high as over 5%, instead the mantra of Mervyn Kings quarterly reports of the past 5 years has been one of the threat of deflation and that inflation would magically always converge to 2% in 2 years time, something that the BoE has failed to achieve 90% of the time! Which illustrates why Mervyn King's Bank of England quarterly reports have amounted to nothing more than economic propaganda as the always imminent threat of deflation continues to be used as an excuse to implement the policies for the theft of purchasing power of wages and savings as the following graph illustrates that since the financial crisis deflation mantra period of the past 5 years, Britain has in effect witnessed Inflation of 20% on the highly suspect official CPI measure of inflation that tends to under report real inflation by approx 1.5% per annum. Which is the reason why ordinary people are increasingly finding great difficulty in getting by in their weekly shopping as the prices are rising at a pace far greater than their net disposable earnings are able to keep pace with. This stealth theft has been engineered by the Bank of England on instructions from both Labour and Coalition governments so as to meet their primary objective of being able to bribe voters with printed money. At huge tax payer cost, all of the liabilities of the bankster's remain firmly dumped onto tax payers that could still bankrupt Britain several times over, and where the bankster's are concerned its business as usual - Heads they Win, Tails the tax payer Loses as the people of Britain will soon find out as all the lawsuits surrounding the LIBOR rate rigging scandal start resulting in awards of multi-billion pounds in damages that Britians tax payers WILL foot the bill for, because the consequences would be bankruptcy which is something that we have repeatedly witnessed that the Bank of England will never entertain. The ultimate effect of the fraud perpetuated upon workers and savers amounts to more than £1 trillion of funny money created over the past 5 years through a myriad of smoke and mirror schemes such as Quantitative Easing, Funding for Lending, and QQE, that has been expended on the bankster's and benefits plague that seeks to keep over 8 million non productive persons of working age sedated on benefits who on their own have been receipt of more than £400 billion that has not been backed by any economic activity but creates demand for consumers goods and services and hence has more than overcome the deflation of average falling wages, which is why we don't have deflation instead we have sustained exponential inflation as the earlier graph illustrates. The only answer the government has ever had in dealing with the financial crisis has been to engage in further outright theft which takes the form of the Bank of England printing money to buy UK government debt, the interest on which the Bank of England then repays to the Government, who treat it as INCOME, and therefore rather than the UK deficit being £160 billion, instead the politicians can claim it has fallen to £120 billion per year. At the rate the Bank of England is monetizing UK government debt by the end of 2015 more than 50% of UK government debt will have been bought by the Bank of England (current approx 1/3rd). However the consequences of what I termed as the Quantum of Quantitative Easing (July 2012) is that it will result in an further acceleration of the inflation trend which amounts to the stealth theft of purchasing power of wages and lifetime savings. The impact on savers of Zero interest rates and the inflation stealth theft is worsened by the 20%-40% additional theft by means of double taxation on savings interest i.e. Inflation erodes the value of your savings by currently about 4% then the government taxes you by 20% to 40% on the sub inflation interest rate you will be in receipt of which means that savers are guaranteed to lose at least 2% of the value of savings per year that amounts to an estimated theft of 14% over the past 5 years. I do not see any sign that the UK base interest rates are going to rise during the next 12 months and given where we are at in the election cycle, a UK base rate rise during the year in the run up to the May 2015 election is also highly unlikely. Therefore I cannot see the Bank of England raising interest rates for at least the next 2 years. The only mechanism that would result in a base rate rise is if the Bank of England lost control of interest rates i.e. the market forced the BoE to raise interest rates during a collapse in confidence in sterling, which could be triggered by an event emanating out of one of our weapons of mass financial destruction aka Britains big banks, i.e. hidden bad debts or derivatives bets that trigger a chain reaction collapse of the banks. One of the Mervyn Kings last tasks was to pave the way for the Bank of England to steal bank deposits Cyprus style during future banking sector bailouts which are INEVITABLE! Here is a further excerpt that makes it clear that only insured depositors will be protected i.e. holdings of less than £85,000 per banking licence. This further reinforces the fact that savers have to take some risk with their capital be it in the stock market or the housing market or commodities because as things stand you are guaranteed to lose at least 1/3rd of the real value of your bank deposits during this decade, with the ever present threat that in a worse case scenario the Government WOULD Cyprus style outright steal near ALL of your money in the bank. You have to realise this that NOTHING has changed in terms of the risk of Britain's Banks Bankrupting Britain because as the recent example of Cyprus shows that a nations banks WILL bankrupt the state! 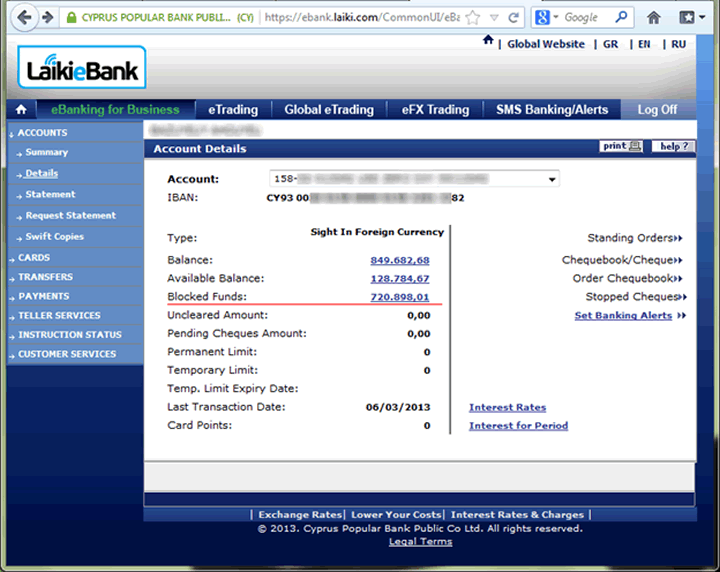 The Bank of England's policy paper for bailing in depositors illustrates that it is not a question of IF but rather WHEN, in which respect you need to act to protect your wealth from theft BEFORE the event, or you too will wake up one day to find 85% of your bank balance has been stolen as the following example of a Cyprus account holder illustrates.